Imagine walking into your studio and having the skill and confidence to create anything you desire. From the tiniest lady’s wristwatch, surrounded with articulated platinum leaves and set with diamonds, to enormous cast-bronze doors weighing over 800 pounds, your ideas can be made any size you want. 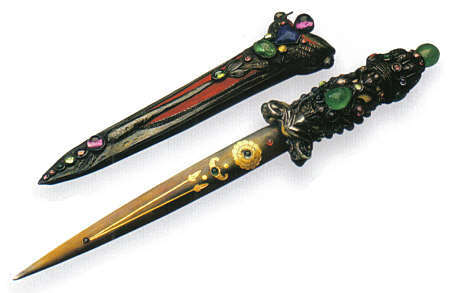 You have training in multiple media, so your art can take form in precious or base metals, in forged iron, carved wood, stained glass, or stone. You have experience designing buildings, monuments, gardens, and interiors, and the many decorative items that transform these spaces into places of transcendent living. Also, don’t forget the long list of prestigious clients who highly regard your abilities and commission you to create magnificent objects to enrich their lives. This was the reality for artist Marie Zimmermann, who, by 1935, at the age of 56, was at the pinnacle of her career and considered one of the greatest craftspersons in America. The press hailed her as a “master of a dozen crafts…perhaps the most versatile artist in this country”  and “the last of the great metal craftsmen…the modern Benvenuto Cellini.”  But what they could not have realized at the time was that as impressive as her range of skills was, equally important was her ability to create significant works of art within the multiple artistic movements that swept across the United States from the turn of the twentieth century to the rise of Modernism. Her artistic curiosity and central location in New York City exposed her to the latest stylistic influences, and she fully embraced the avant-garde. Zimmermann’s body of work contains outstanding examples of the Belle Epoque, the Aesthetic Movement, the Arts and Crafts Movement, Greek and Egyptian Revival, Art Deco, and Modernism. Marie Zimmermann was born in Brooklyn, New York, in 1879 to parents of Swiss descent. She had two brothers and a sister and grew up in a home filled with culture and an appreciation for the finer things. Her father made a good living selling straw to hat manufacturers, and she was encouraged to pursue her own passions and goals through education. 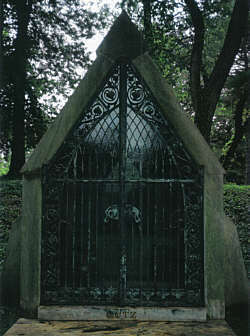 Zimmermann related in a 1935 interview that when she was much younger, and trying to decide if she wanted to become a physician, she saw an advertisement for a course in metalworking at Pratt Institute.’ Against almost everyone’s advice, she enrolled and was soon determined to pursue her future in the arts. She also joined the Art Students League in Manhattan, where she studied drawing, painting, and sculpture. Zimmermann’s artistic education consisted of rigorous technical training in the studio and further aesthetic development through a study of the great collections at the museums in New York City. Places like the Metropolitan Museum actively encouraged designers and manufactures to study pieces in their holdings to inform and inspire contemporary craftspeople. Zimmermann was a frequent visitor, and particularly loved the Greek, Egyptian, and Far Eastern rooms. She later built an extensive personal library from which she could draw inspiration from great art around the world. In addition to developing her personal aesthetic style, Zimmermann labored to learn the skills of making art. In response to a reporter’s question of how she mastered such a broad range of crafts, she replied, “It took me 25 years, with each day of them filled with 10 to 12 hours of work.”  To another journalist she said, “It takes work…the old craftsmen were not afraid to work until they got something perfect.”  She admired the ancient masters of Italy, the Cellinis and Michaelangelos, and wanted to follow in their footsteps. She would later employ and train up to six assistants in her workshop, but she always executed herself the original patterns that they would faithfully follow. A key source of the genius behind her work was that she used many of her own creations in her home. By living with her work, she understood subtle features that made her pieces usable. Her candleholders, for instance, were tall and very narrow at the stem, so that dinner guests could see one another across the table. The same candlesticks came with inserts to accommodate differently sized tapers so an owner of her work wouldn’t have to shave off candle wax to make it fit. 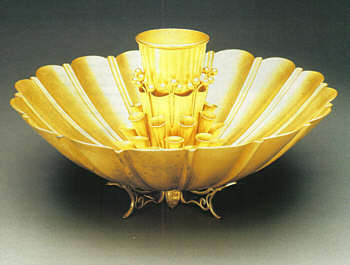 One of her magnificent centerpieces used a central metal frog that held individual flowers, and each holder was drilled so that water could flow into all the separate compartments at once. 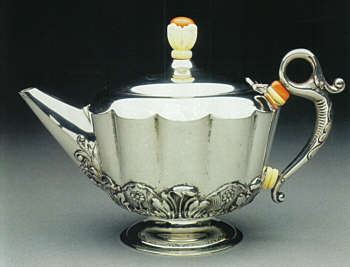 When Zimmermann began extensive use of Rhodium plating on her work, it was in an effort to free her clients from the drudgery of constantly polishing silver so they could enjoy using the pieces every day. 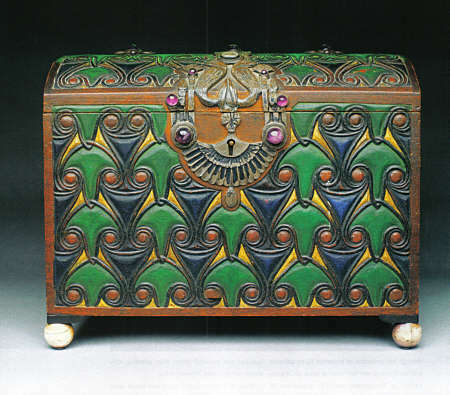 The earliest record of work exhibited by Zimmermann is the First Annual Arts and Crafts Exhibit at the Art Institute of Chicago, held December 16, 1902 to January 10, 1903. 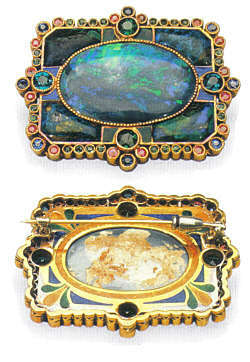 She showed two pieces: a pin in gold and mosaic and a bookplate. Sadly, there is no further record of her artistic progression until more than nine years later, when she exhibited four pieces of jewelry for the Art Institute’s Tenth Annual Arts & Crafts Exhibit. A number of major changes had obviously taken place in the interim. One significant influence during this period was her membership in the National Arts Club in New York City. This prestigious institution, located in the historic Tilden Mansion on Gramercy Park, was founded as a gathering place for artist and patrons, to help foster an American artistic sensibility. With members like William Merritt Chase, Augustus Saint-Gaudens, Alfred Stieglitz and three United States Presidents, it must certainly have been an honor for a young artist in her early thirties to be invited to join. After establishing her studio in some upper rooms, Zimmermann remained there for the next 25 years. For her customers, this location—with its downstairs parlors and music room, exhibition gallery and large stained glass dome — suggested that Zimmermann had already reached the higher levels of the American art world. Her manifold skills had by age 33 developed to a point where she, alone, designed a large and gracious family vacation home in Pike County, PA. Today, that home is an historic site, displaying much of the rustic elegance associated with the Arts and Crafts Movement. The house, with its exposed beams, sweeping grand staircase and conical, ieldstone-turret entrance, was ventually filled with immermann’s work, including arved wooden tables and deboards, forged fireplace screens and tools, chandeliers, candelabras, vases, and fountains. The family vacationed there and she relished the outdoors, pursuing her love of hunting, fishing, and riding horses. Naturalistic forms like leaves, berries, vines, and flowers were always significant design motifs in her art, and the time she spent in Pennsylvania was a source of inspiration. Zimmermann’s early work was very much in the tradition of the Arts and Crafts movement. The three institutions that educated her — Pratt, the Art Students League, and the National Arts Club—were all founded as part of a reaction to the perceived decline in the quality of life that was associated with the increase in industrialization and anonymous machine-made products. Proponents of the movement believed authentic processes, honesty of materials, and a refinement of ornament would help connect the user of an article with the essence of that object and its maker, enriching the lives of both parties. Much of the inspiration for this movement came from a look back to the Middle Ages, with its strong, pure forms and organization of workers into specialized guilds. 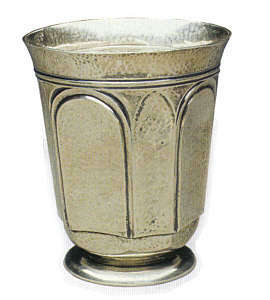 Zimmermann’s sterling silver tumbler is a perfect example of this interest in Medieval and Gothic design. Its simple lines and almost architectural proportions impart a rugged practicality that suggests everyday use. The fact that the planishing marks were left on the surface also hints at the way the piece was made and its connection with the hand of the artist. In other pieces, Zimmermann sought to refine the essence of form and loosen the weight of the line. The Aesthetic Movement drew inspiration from the Japanese designs that reached the Western art world after Commodore Perry’s 1854 treaty with Japan. 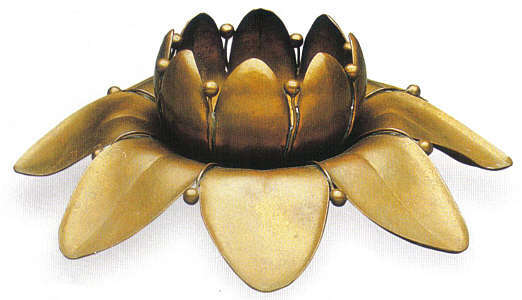 Zimmermann’s gold plated and lacquered lotus finger bowl is a wonderful example of her fascination with the Far East. She had many contacts with antique dealers in China, and she imported pieces of old, carved jade and hard stone. She used these as inspiration for her pieces, often combining them with semiprecious stones and using them as finials on raised or constructed containers and vessels. As she continued to experiment with form, Zimmermann began to acknowledge in her work the lack of symmetry and imperfections in nature. She raised bowls that looked like dried and curled maple leaves. The precious and semiprecious stones she used were frequently cut irregularly, or simply roughly tumbled, referencing the truer shape of natural rocks. One cast bronze vessel is perhaps her best example of capturing the essence of Art Nouveau’s full embrace of the cycle of waxing and waning in nature. 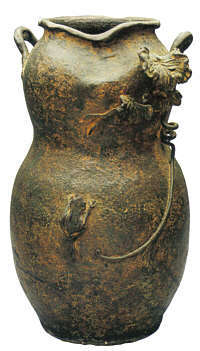 The frog and flowering vine are highly stylized and become almost a gesture on the form of a gourd that has just passed its peak and is beginning its return to the soil. Within Modernism, the final distillation of form and line dispense with the figure altogether. There is no applied ornament or design, there is only the shape itself. The clean lines, bold color, and elegant shape of Zimmermann’s gold dish, probably made in the mid 1930s, fully embodies the Modern ideal. It is not minimalist, because it is still highly designed with a form that articulates a point of view. But it is pure, with little evidence of how it was made or if it is to be “used” at all. This piece represents how far Zimmermann would take her skills of traditional metal raising, making them relevant to an age that was consciously trying to break with the past and find new forms of expression. It would be a mistake to assume that all Zimmermann’s work can be placed on a rigid timeline that follows the changing tastes of this country in the first half of the twentieth century. She felt comfortable working in all manner of styles, and her most cutting edge designs were often the least popular. 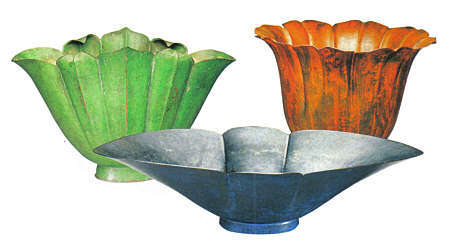 In 1921, Zimmermann exhibited several metal bowls at the Boston Society of Decorative Art. These pieces were ahead of their time—she employed techniques that are still controversial today. She used pigmented wax and paint over a patinated surface, completely hiding the metal beneath. Today, these pieces are undeniably striking, and the blue bowl is part of the collection of Boston’s Museum of Fine Art, but it was not acquired until some 60 years after its initial display. At the original showing, not a single piece sold. Despite the tepid reception in Boston, there was much enthusiasm for Zimmermann’s work in the rest of the country. The very next year she exhibited pieces at the Metropolitan Museum of Art’s Contemporary Art display, where a covered silver container decorated with garlands and rubies was purchased for their permanent collection. She subsequently showed at the Detroit Society of Arts and Crafts and the Ehrich Galleries of New York City. In 1924, two more shows featured her work, including an exhibit at the Art Institute of Chicago, where she was awarded the Logan Prize for her jewelry and silverware. The pieces were cast at the Roman Bronze Works of Brooklyn, New York, then the leading American fine arts foundry. They cast original work for such preeminent sculptors as Saint-Gaudens, Remington, and Russell. 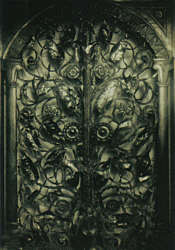 The founder, Ricardo Bertelli, was considered the leading bronze expert in this country, and wrote to Zimmermann: “I hope you will be able to convince your client that this door is the only one ever produced in this manner and is absolutely unique in originality and execution, impossible to be duplicated at any cost.” When the doors were finished, they were exhibited at P. Jackson Higgs Gallery in New York. Marie Zimmermann was now very much in demand. Clients came to her studio to browse through her collection of imported Asian antiques and textiles and see her original work on display and in use. Zimmermann would do special one-off commissions, like a golden riding spur, encrusted with gems, for a woman who loved horses, or design an entire living room with custom furniture and decorative iron. She made both elaborate objets d’art, like fans of dyed ostrich feathers, gold, ivory, and emeralds, and modest household objects, such as plant stands of patinated cast bronze. She combined unusual materials with qualities she admired rather than selecting only those with the most inherent value. Many of Zimmermann’s vases and bowls were not raised by hand but rather spun with a lathe. The forms would then be chased, on the inside and outside, and the edges trimmed. Her signature use of color surface treatment transformed these objects into bold, modern, and affordable decorative accents. Working in this manner, with her several assistants, allowed her to produce a tremendous body of work. There are probably several thousand of her works in various homes around the world. She usually signed her work with a stamp bearing the legend “M. Zimmermann, maker,” or a superimposed “M” and “Z” in a circle, but sometimes these marks were small and subtle. Many unsigned examples exist, and their provenance can only be established with exhibition photographs and inventories. The most exciting examples of Zimmermann’s mastery are the rare occasions when she designed every detail of an environment. For instance, when she was commissioned to build a memorial shrine for the Rudolph Metz estate, she drew up the building plans and supervised its construction in Georgia marble. She made custom glass windows and framed them in bronze. She designed a mosaic ceiling and gates for the entrance. She even planned the landscaping and decorative plantings around the structure. It would seem that there was nothing Marie Zimmermann would not apply her hand and eye to making. But at the height of her career, her personal life began to etch away at the force that had so strongly driven her to work. Within five years of the death of her mother in 1933, her father and all three siblings had also died. Zimmermann was overcome by deep depression and bitterness. At the end of 1937, she gave up her lease on the Gramercy Park studio and the following year she moved to the farm in Pennsylvania. Her pieces were still shown for a few more years in places like Santa Barbara, the World’s Fair in New York City, and the Golden Gate International Exhibition, on Treasure Island, San Francisco. But Zimmermann essentially retired, and lost interest in making any more work. She surrounded herself with art she had done in the past, but now spent her time riding, hunting, and fishing. Her retirement allowed her to relax her rigorous schedule and enjoy some of the simpler things in life, like reading, which she did voraciously. Among her papers was found a guest book that was filled with happy memories from the many friends who came to stay with her. As she got older, she spent her winters in Florida, eventually moving there permanently. In 1972, at the age of 93, on her birthday, she died. Marie Zimmermann was an accomplished artist whose achievements are still not fully recognized by modern scholarship. Her unrivaled mastery of so many crafts is certainly of tremendous importance, but what is perhaps rarer is an artist with the ability to transcend a specific period of work or style and continue to make monumental contributions to the field. Zimmermann’s greatest strength was her embrace of the changing tastes in American art, and her courage to experiment and move her work forward. M. F. Roberts to Robert N. S. Whitelaw, Director of Gibbes Memorial Art Gallery, Charleston, SC, February 27, 1935. Harriette Ashbrook, “Woman Master of a Dozen Crafts,” Brooklyn Eagle, 6 June 1926. Frank B. Gilbreth, “Female Cellini Shows Art Here,” News and Courier, March 1935. Wendy Kaplan,’The Art that is Life,” in The Arts & Crafts Movement in America, 1875- 1920 (Boston: Little, Brown and Company, 1987), 270. David Cole is a practicing artist and founder of Svartvik Metalworks, Ltd. in Oakland, California.